Fast updates, a large and beautiful display, and great performance: the Nexus 6 remains a very attractive choice for fans of pure Android, and today it’s available from $249 on Amazon. The Motorola-made Nexus 6 is available in white or blue for $249 for the 32GB version, while the 64GB model (white only) costs an extra $50. This is an unlocked model offered with one year of US warranty; make sure to check if it’s compatible with your carrier before clicking the buy button. The 32GB Nexus 6 can normally be bought for $349, while the list price is a whopping $650. At $100 off, this is a pretty sweet deal for someone who is looking for a Nexus 6P alternative on the cheap. For more details on the Nexus 6, check out our in-depth review and versus comparison with the Nexus 6P. This is not a Daily Deal promo, so it’s possible that the deal will be valid through the following days. That said, we recommend you make up your mind sooner, rather than later. Early on Black Friday, Motorola surprised everyone with an incredible sale where you get the 32GB Nexus 6 for only $250. Well that deal is back on and you can head over to Amazon and grab the 32GB Nexus 6 in either Cloud White or Midnight Blue. The Nexus 6 has seen quite a fluctuation in pricing even before the release of this years Nexus devices, the Huawei Nexus 6P and the LG Nexus 5X. However, at $250 for a brand new device, this is by far the best deal we’ve seen for the Nexus 6. You’ll want to act fast because at the time of this writing the 64GB variants have already sold out, but both the Cloud White and Midnight Blue are still available in 32GB. If you want a device to test drive Marshmallow and all the new features coming out for Android, but you don’t want to break the bank, then this is a deal you simply cannot pass up on. With its 6″ display, huge 3220mAh battery, and timely updates, the Nexus 6 is still the perfect device for that Android lover that you know. We can also count on the Nexus 6 having continued support from the rooting community, even after the updates from Google stop rolling in. It’s also worth noting that this deal is for the Unlocked variant of the Nexus 6, meaning that it will work on any GSM carrier, and will even work with those on Verizon. Additionally, this deal comes with a one year warranty directly from Motorola, so you’ll have some help if you have any issues with your device. Drop us a line and let us know whether you were able to jump on this great deal, or if you were able to grab one during the last round of price cuts. The post [Deal] You don’t want to miss this deal for the Nexus 6 appeared first on AndroidGuys. Honestly, it’s surprising that the Motorola-manufactured Nexus 6 has lasted so long – we thought the Nexus 6’s days were numbered once the Nexus 6P was released but it’s survived a good few weeks even after been discounted. Sadly, though, it’s officially time to say goodbye – if you visit its Google Store page now (which is now only accessible directly via link) you’ll see that the Nexus 6 is no longer available for purchase, which is usually Google-speak for this product has been discontinued. The Nexus 6 won’t be remembered fondly by everyone – it was the most recent Nexus smartphone to bring premium to the table and its high price and large size was off-putting for many. Those objections have obviously subsided in time for the Nexus 6P, and perhaps we can start to look at the Nexus 6 for what it was – the start of a new trend for Google that has led to more premium products. Of course, the owners of the Nexus 6 will remember it very differently (especially if they’re still using it), and it’s the type of device that you have to use to understand how good it is. Of course, if you do still want to get on the Nexus 6 bandwagon, there’s likely going to be a few floating around at various retailers, but stock is going to be finite from now on, so get on it! What are your fondest memories of the Nexus 6? Let us know in the comments below. The post Adios, mi amor: the Nexus 6 is no longer available from the Google Store appeared first on AndroidSPIN. It is a new era for Google. One in which users don’t have to opt for a supersized smartphone just to get the Nexus experience. The Nexus 6P and Nexus 5X have come to complete the equation with a couple form factors, varied prices and different levels of performance. The time for the Nexus 6 to die was imminent, and Google has pulled the chord today. In what appeared to be a very quiet move, the Nexus 6 has disappeared from the Google Store. There is no available comment or announcement from the Search Giant, so we are not sure if this is really a permanent thing, but I would probably bet on it. This gets some of us a bit melancholic. Regardless of whatever inconveniences it may have brought, it was a special phone. Made by Motorola, it introduced a great design and build quality that didn’t need anything fancy to offer a solid experience. It also happened to be the first Nexus device to come at this (nearly) 6-inch size. And though its initial price was a bit high, it was worth every single penny. I say it was a great smartphone with one compromise… a large one (yes, I am talking about the size). It will be sad to see it go, but better things are coming… and some are already here! Oh, and if you are really having a hard time saying goodbye, you can still get the 32 GB Nexus 6 from Amazon for only $349.99! Out with the old and in with the new. Google released the Nexus 5X and Nexus 6P, and immediately started selling the last gen Nexus 6 at a discounted rate. It was only a matter of time before they discontinued it completely, and that day has come. If you check the Google Store, it says “The Nexus 6 is no longer available for purchase”. Not only that, but the Nexus 6 isn’t even on the main phones page anymore. We doubt Google sold literally every Nexus 6 they had in stock and will probably continue to sell them in other locations like Amazon for the time being. Android 6.0.1 has only just hit a range of Nexus devices in the past 24 hours, so users are still discovering a few new hidden extras packed into the update. While the chief feature of the update was touted as new emoji support, the update has also brought a double-tap power camera shortcut to the Nexus 5, 6, 7 (2013) and 9, along with tweaks to the Do Not Disturb mode. This double tap power button camera shortcut originally appeared with the new Nexus 5X and 6P models, but now a wider number of Nexus owners can quickly launch their camera when the screen is off, which is bound to come in useful when you really quickly need to capture a picture. Another not so new feature in Android 6.0.1 is the reintroduction of “until next alarm” feature to the OS’ Do Not Disturb notification mode. Rather than manually having to mute and unmute system sounds, this mode can be used to automatically unmute notifications once your alarm goes off in the morning. Another pretty useful addition. If you haven’t updated your Nexus yet, click the big orange button below to go and grab the factory images. We also have a handy user guide for installing Marshmallow here too. We’ve had the Android 6.0.1 update on our radar for some time now and it seems Google has decided today is the day – Google has released the factory images for Android 6.0.1 for the Nexus 6P, Nexus 5X, Nexus 6, Nexus 5, Nexus 7 (2013), Nexus 9 and Nexus Player. While the update inevitably contains the December security update, one of the more anticipated additions are the new emoji that SVP of Android Hiroshi Lockheimer announced would be coming in this update. 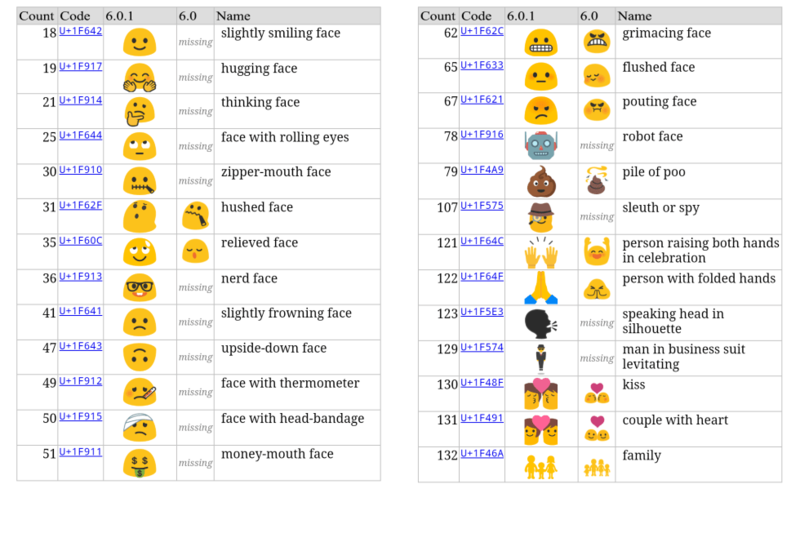 We also got a sneak peek at all the new emoji if you’re not keen on flashing a new factory image right now. As with all software updates, you can either wait for the update to roll out to your device – which can take days or weeks depending on where you are – or you can download the factory image from the Google Developers website and flash it yourself. In case this is your first time, flashing a factory image will wipe everything on your device, so make sure to backup everything before you attempt anything – otherwise, you might be better off waiting for the OTA (over-the-air) update. Are you excited to see the factory images for Android 6.0.1? Let us know your thoughts in the comments below. The post Factory images for Android 6.0.1 update have been released appeared first on AndroidSPIN. Google has published the factory images for the long-awaited Android 6.0.1 update for the Nexus 5, Nexus 5X, Nexus 6, Nexus 6P, Nexus 7, Nexus 9 and Nexus Player. The upgrade brings a brand new Emoji set to these devices, in addition to the latest security patch which is targeted at resolving any critical issues present in the open-source operating system. Hit the source link below to download the factory images from the official Google Developer Blog for manual flashing. Alternatively, you can wait for the OTA to start rolling out, which should start soon. We know that most of you are still waiting patiently for Android 6.0 Marshmallow update to hit your smartphones. And it only hurts more when we hear that some Nexus devices have now jumped the queue to receive the Android 6.0.1 update. Yes, you read it right – Google is pushing the new software update to the Nexus 5X, Nexus 6P, Nexus 5, Nexus 6, Nexus 7, Nexus 9 and the Nexus Player. As part of the software update, devices running the latest version of Android would receive 200 new and redesigned emojis. The good news for the world obsessed with texting is, Google has included unicorn, cat, cheese-block, popcorn and taco emojis in the latest update. Just like we informed in our earlier report, many old emojis such as poop and body parts have have been redesigned and recolored. It is noteworthy that the new emojis have already been available on Windows 10 and iOS platform for a few weeks. Another small change that users who have tablets running Android 6.0.1 will notice that the ‘Back’ and ‘Home’ navigation buttons are now located on the left hand side of the display’s base instead of their central position. The Android 6.0.1 factory images are also available to download on Nexus 6P, Nexus 5X, Nexus 6, Nexus Player, Nexus 9, Nexus 7 (2013). The post Google rolling out Android 6.0.1 update to Nexus devices appeared first on AndroidGuys. Last week, Samsung pushed out an update to the Gear S2 that enhanced its functionality and features. In order to update the wearable device, users need to do so from their Android phone’s companion “Gear Manager” app. As can be seen above however, this simply won’t work with the Nexus 6P, and by logical inference, with the LG Nexus 5X, or with the Motorola Nexus 6 as they all make use of factory-set encryption. In fact, based on this notion it won’t work with any encrypted device, something that may soon become a common finding given that Google has more-or-less mandated it for Marshmallow. When attempting to update the Gear S2 software, the Gear Manager app requests that the smartphone be decrypted for installation to occur. It then provides a link to the Security setting menu, however due to the aforementioned “problem” with the recent Nexus devices, it’s impossible to toggle the necessary setting. Another major issue I’ve noticed is that the Gear S2 doesn’t seem to function properly with the Nexus 6P, at least as far as Push notifications go. Despite my manually allowing the wearable to have permission to access notifications and all required requirements, the notifications still won’t get sent to the watch. Yet ironically when I made a phone call earlier today, it was sent to the watch as opposed to the phone. At one point last week the notifications were coming through: it was just after an update arrived to Gear Manager last Monday. Upon doing so, everything magically worked. Oddly enough however, despite the smartwatch not seeing a firmware update due to the encryption issue, the Gear Manager app then refused to acknowledge there was an update available if I checked. Today, I did a soft reset on the Gear S2 and the problem is back again. Will Samsung solve the situation? It’s difficult to say what Samsung will do here. Given that the Gear S2 is designed for a Samsung mobile, the fact that it works at all with another OEM’s product is kind of a bonus. Still, recent updates to the Gear Manager software have made reference to support for “Android M” and thus at the very least Samsung is aware of some bugs that may be present. In terms of the encryption issue though, there will presumably be very few users who have a Gear S2 and a Nexus device and thus the problem will inevitably be of extremely small priority. This might change though, if mandatory device encryption becomes a status-quo for Marshmallow. Let’s see what happens…fingers crossed!